Guide to Lenders Reviews - Is it a Scam or Legit? 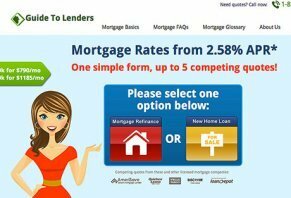 By providing quotes from 4 competing lenders after filling out an online form that takes less than 5 minutes, Guide to Lenders is a website that claims to make the process of obtaining a mortgage quicker, easier, and stress free. But can Guide to Lenders’ network really help you obtain low mortgage rates, and are their services worthwhile? We did some digging around and here’s what we found. Using their network of over 150 lenders, including AmeriSave, Quicken Loans, Wells Fargo, Loan Depot, and many more, Guide to Lenders claims to help you shop around for a mortgage, which could ultimately help save you money. As such, the company claims to have served over $16 billion in loan requests since opening their doors in 2005. Fill out the simple online form in less than 5 minutes. To begin the quote process, you’ll need to indicate whether you’re looking to refinance your existing mortgage or to obtain a new home loan. Then, you’ll input your zip code, property type (e.g. single family home, etc. ), how it will be used (e.g. primary residence, investment, etc. ), overall credit rating, property value, if you want to cash out any of your equity, date of birth, and email address. Next, Guide to Lenders claims to send an email comparing quotes from up to 4 different licensed mortgage lenders. Finally, you can choose the offer that best meets your needs. In addition to helping you obtain a mortgage that meets your needs, Guide to Lenders also claims to help educate you by providing a section on their website dedicated to Mortgage Basics, as well as a Glossary section dedicated to common mortgage terminology. Guide to Lenders is completely free to use and there are no hidden fees associated with their services. This is because the company is not a broker or a lender, but instead is a lead generation website that sells your information to one or more of the lenders in their network, for which they charge a fee. Because of this, interest rates and other fees associated with your mortgage will vary based on a variety of criteria such as loan amount, credit rating, total down payment, and much more. If you’d like to get a better idea of how Guide to Lenders works or to ask any questions, you can contact the company directly at 888-680-9459. Is Guide to Lenders Your Best Option? First and foremost, remember that Guide to Lenders only works with residential properties, which means that if you’re looking to finance a commercial property you’ll need to look elsewhere. Next, Guide to Lenders only sells your information to its lender network in an attempt to help you obtain the lowest rates, and does not provide any mortgages themselves. Finally, the owner of Guide to Lenders, Quinstreet Media, Inc based out of San Mateo, CA, holds a B+ rating with the Better Business Bureau based on 18 closed complaints over the past 3 years. Of these complaints, the most common appear to reference receiving unwanted emails and phone calls soon after signing up. Outside of the BBB, there aren’t many online reviews related to Guide to Lenders, which might make sense because they offer a free service and most problems would arise with their network of lenders, not with Guide to Lenders themselves. If you don’t mind having your information shared with unrelated third-parties who will likely call/email you for the purposes of selling, Guide to Lenders may be a good option for finding the lowest mortgage rates available. I applied with these people, received a phone call after the application, and walked through the whole process. I have attempted to contact them at least five times, and no one has got back to me. I can only conclude that it was a scam to get my information and sell it to others. I have never received any information after the initial phone call to get my information on the loan. I attempted two online checks to get an idea if I could be approved for a loan before applying. I used Lending Tree and this Guide To Lenders. The next day or two, I get an email from Avant saying I have an application on hold for me to finish. Note, I have never actually applied for the loans. This one is fine, may be part of the "checking" process. I also get an email from LendingPoint (not Lending Tree) saying that my APPLICATION was denied. I called them, and sure enough, there was a legit application for a Small Business Loan. I was checking out personal loans, but the bank the information was processing for was a bank that only does auto and SBA loans in Utah. They said the company that the application was for, however, was Quin Street. I look them up, and they are in California, like Guide to Lenders, while Lending Tree is in New York. Also, Guide to Lenders shows both Advant and LendingPoint as one of the companies they work with right on the page you use to check. So the evidence points to Guide to Lenders, but I can't say exactly which site did it. But having an actually SBA in your name is serious stuff, which I now have to get removed and see how much my credit information is in jeopardy. So I learned my lesson, anyhow. This is undoubtedly a scam. The company, after gathering your personal information online, will call you and tell you that you've been approved for a loan regardless of your credit score or any proof of employment. The catch is that in order to prove that you can afford monthly payments, you have to buy iTunes gift cards and share the pin number with them over the phone or email. After this, they will tell you to pay for a large tax required to transfer the funds to your bank account, which you have to pay for using iTunes gift cards again, which should be a major red flag! Long story short, the loan will never come, and you will end up in a worse economic situation than you started. Write a Review for Guide to Lenders!